I’m having trouble maintaining an election. – Sunshine. Whimsy. Tacos. I’m having trouble maintaining an election. On November 10, 2014 November 10, 2014 By StevenIn The U.S. I wrote last year about election time in Germany, and one of the aspects which fascinated me the most was the incredible variety of poltical parties in the race. Throughout my time in Germany, I had made arrangements to vote by absentee ballot. The Broward County supervisor of elections office e-mailed me a PDF of the ballot for each election, and I printed it out, filled in the dots, scanned the result, and faxed it back. I still voted by absentee ballot in Tuesday’s midterm election because it was simpler to just follow through that way than to change my voting status this close to the election. Because the Broward SOE has my (former) German address, I received these campaign mailings in Germany as well; big glossy cardboard fans of fluff and nonsense. I did notice an interesting trend: the mailings that I got while overseas were more often Republican than Democrat. I assume that’s because the Republicans know that deployed military families are more likely to vote Republican and the Dems probably choose not to spend their money in that arena. That’s just a guess, though, because Jenny (who has been receiving my postal mail since I left) made an observation that it’s very difficult to determine their party just from the mailings: They often show no outward sign of which party affiliation they hold. That didn’t affect the sheer volume of them, though. If you have enough registered voters at your postal address, you could easily wallpaper a room with the mailings. The Robocalls are prolific and awful if you have a land line, like my father. I received none of them on my cell phone this year, however, which was nice. That didn’t stop me from seeing the television commercials when I got back, or hearing the radio commercials. Or hearing the endless discussion of the midterm elections on the news. The elections went on this past Tuesday, and the Democrats took a pretty substantial hit. The Republicans have been making pretty, empty noises about working with the Democrats to get things done, but the very next breath included things like repealing Obamacare and impeaching the President- that doesn’t seem very cooperative to me. Now that the Republicans have control of both the Senate and the House of Representatives, I expect Presidential vetoes to hit an all time high. One of my Facebook friends commented that now would be a great time to buy stock in Mont Blanc. I’m just glad the election is over. For all the Sturm und Drang about the massive shift in power, I really don’t think that anything will change: Our Congress will still accomplish very little, and the state legislatures will continue to quietly remake the country in their ideological image. But at least the mailings and the commercials will stop, at least until 2016’s Presidential election starts to ramp up. 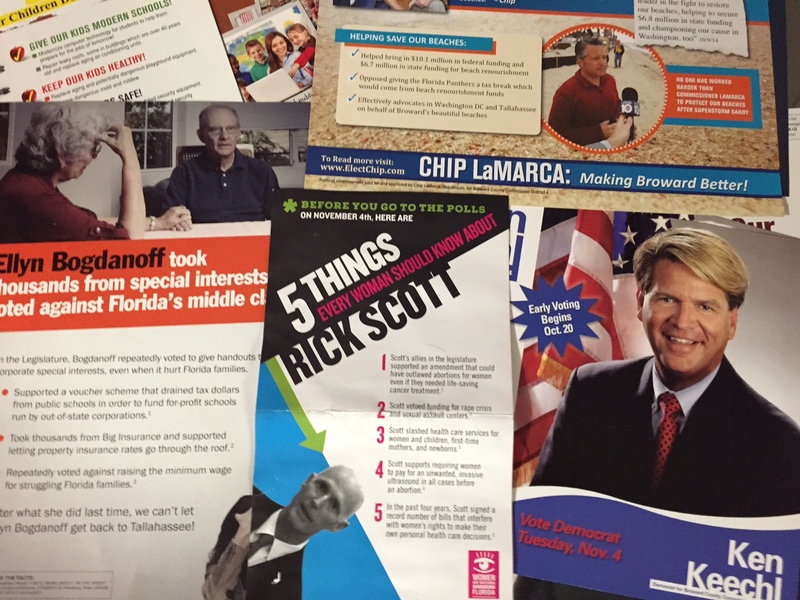 Were you annoyed by this year’s campaign ads, flyers, brochures, signs, and zeppelins? I think if they get your name, it just goes in the pot for mailings. I get stuff from ALL KINDS of parties even though I am pretty firm in my voting history and affiliations. My mailbox is usually stuffed full of flyers every day leading up to the election! I used to be sooo into the political discussion when I lived in the states. Now I can’t read it or watch it. Totally bummed that Wolf Blitzer hijacked my CNN World the other night.